In 2006, the track was in poor state, with many small river crossings, water logged sections, and exposed rocks. There was no vehicle access beyond 6.5 kms (about 16.5 kms from the main road). In 2006 and 2007 it was necessary to improve access to the property. A road was constructed to the site for the main house and culverts were installed at small river crossings and problematic wet areas. Some bridges were rebuilt. 4 x 4 vehicle access is allowed for about 6.5 kms through the property, but the road remains vulnerable to damage from vehicles. The road remains not accessible for vehicles beyond that point. 3. Ensure that you have all necessary minimum equipment at hand, shops are inaccessible. elements potentially damaging for Nature regeneration and protection. ➢ Round shaped, without separations inside and with large windows. This shape, with windows all over the curved wall, allows life in constant contact with the surrounding Nature. 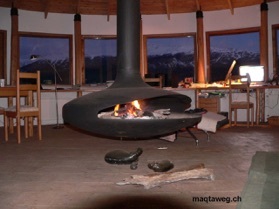 heating method as there is a lot of dead wood on the property left by the degradation of the ecosystem of the valley. ➢ The floor is made of terracotta, it accumulates the sun heat during the day and releases it at night. Pipes from the stove passing under the terracotta heat the floor and the heaters. 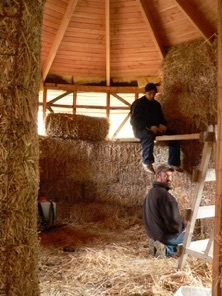 ➢ The house is insulated with straw bales and white plastered. The outside is made of local wood. ➢ Building far away from the main road is difficult. 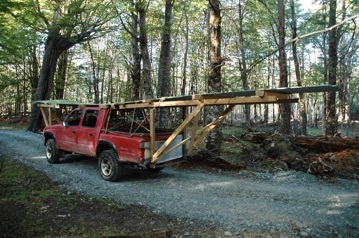 Here is the garage roof traveling on the precarious dirt road to the construction site. 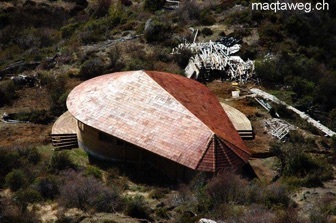 ➢ The roof is covered with tiles of self-dead alerce hardwood. Management of people passing by : setting a well marked path through the Project. Use of horse power to move trees for reforestation. ➢ The house is bioclimatic but not entirely build from old or self-dead material. ➢ Windows are washed to the minimum, clean windows are real dangers for birds. The Project has 3 small houses. The waste management of these 3 houses is subject to the general policy of waste management of farm houses of the Aysén region, that is to say - almost none. There are no tourist activities, so there are no wastes from the tourist industry. Clothing, textiles - charity association in Coyhaique. 3 septic tanks - final water filters in the soil.